The MPOP® continues to improve! We completed another round of enhancements and features. Your feedback plays such an important role as we strive to continuously improve the entire platform. Please keep the excellent feedback coming; we love to hear your ideas and suggestions! We’re excited to share several new user enhancements to help you be more productive and make your campaigns even more effective. DDC Reference Codes are now available! The reference codes create a new layer of automated daily reporting capabilities within your website’s proprietary reporting system. This feature is seamless and attaches the proper Dealer.com tags to the end of your campaign URLs. It will appear as: “…utm_campaign=grand+caravan&ddcref=email“. Reference codes are applied to campaign activity such as paid search and email campaigns when this feature is turned on. The MPOP™ is also flexible enough to work with your reporting needs whether your dealership is using UTM codes, Google Event Tracking, or reporting dashboards such as VistaDash. We can help streamline your analytics by using additional reporting features such as Content Grouping. Content Grouping lets you group content together to compare different metrics using a specific group name. This also helps you see an individual URL, page title, or screen name. For example, you can see all of the pageviews in a group such as New/SUVs and then see each URL or page title. Dealer Teamwork is the only company in the industry who provides this level of transparent reporting. We can set it up however you want! New Zip/Postal Code Field for Audi Lead Forms. The Zip/Postal Code field can be added to ensure 100% compliance for lead form submission tracking for Audi dealers. This is a feature that your Account Manager can help you turn on within the global settings of the MPOP™. Zip/Postal Codes can be turned on in the Admin section of the Global Settings. Subscripts now Available for Disclosure. Add multiple subscripts to allow for more details in the disclosure for state-specific rules and regulations. The subscripts are listed in order within the offer and the disclosure for cleaner presentation and readability. To turn this on, check the “Show Pricing Subscripts” box in the Disclosure tab. 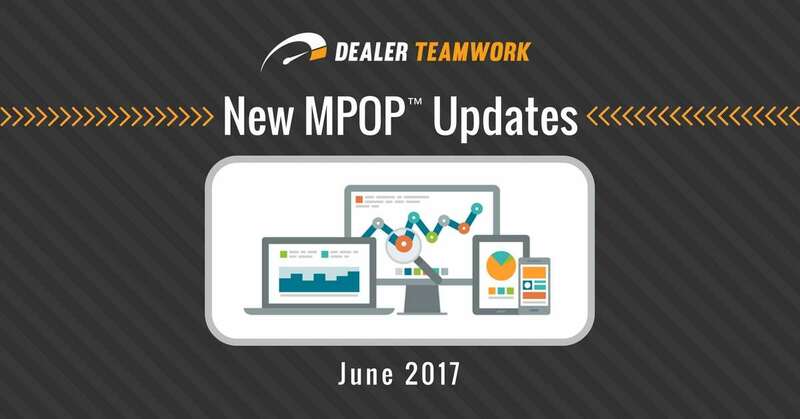 All dealers will be transitioning to DNI to improve the MPOP’s™ reporting capabilities, to provide higher levels of attribution, and to raise the overall value of the platform for you. Your offer pages receive dynamic tracking numbers and automatically update as the user moves to the next page. Phone call attribution from specific sources helps provide the ROI reporting your marketing efforts deserve. Dynamic Number Insertion reporting will be included as part of your monthly client reporting. Be sure to speak to your Account Manager about using the DNI feature if you have any questions. Bulk Editing Feature. You can now select multiple offers to activate, deactivate, or delete offers in bulk. This feature is a huge time-saver for you as it simplifies some of the most common functions dealers use every day. Select your offers, choose a function from the Bulk Edit drop-down menu, then click update. Loaner Car Feature. Quickly select the loaner car status to remove the “used” label from the title of a vehicle. This is very helpful for dealers who are promoting their demo and loaner vehicles.